Two new studies suggest that foreign-born residents pose less of a public safety threat than people born in the United States, offering the latest challenge to President Trump’s ongoing claims about immigration and crime. A report published late last week by the Sentencing Project shows that immigrants commit crimes at lower rates than American-born citizens and that violent crime rates in the U.S. plummeted as immigrant populations increased. Meanwhile, a separate analysis by the Cato Institute found that all immigrants — including the undocumented — are less likely to be incarcerated than native-born Americans. Since his first days as a candidate Trump has repeatedly asserted an inextricable link between criminal activity and undocumented immigrants, arguing that an aggressive crackdown on immigration would help rid American communities of rapists, drug traffickers, and killers. 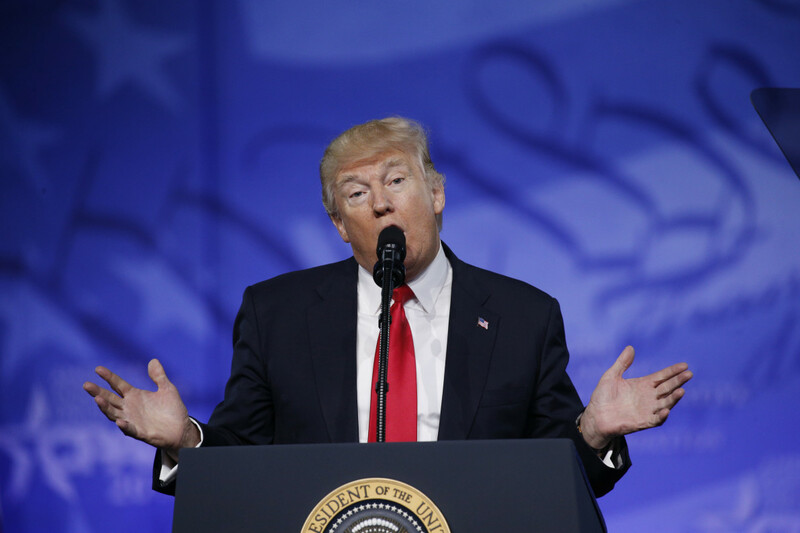 As president, Trump’s rhetoric on immigration has softened only somewhat. The president is now seeking nearly $7.5 billion in new spending on immigration enforcement, according to an analysis of his proposed budget by the Wall Street Journal. The report goes so far as to suggest that higher levels of immigration to the U.S. in recent decades may have contributed to an historic drop in crime rates. Violent crimes plunged from 730 per 100,000 citizens in 1990 to 362 in 2014, according to the study. During that same period, the number of undocumented immigrants grew from 3.5 million to 11.1 million. The findings by the Cato Institute, a libertarian-leaning think tank, show that U.S.-born citizens land behind bars at nearly twice the rate as undocumented immigrants and more than three times the rate of immigrants with legal status. 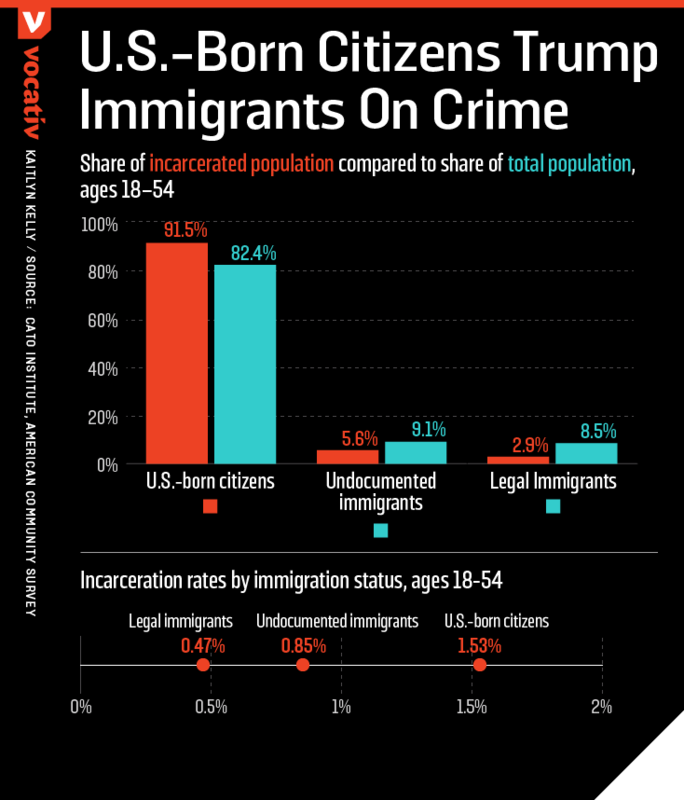 Roughly 1.53 percent of those born in the United States between the ages of 18 and 54 were behind bars, as were 0.85 percent of undocumented immigrants and 0.47 percent of legal immigrants, the think tank’s analysis of American Community Service data found. That’s roughly 2 million American-born prisoners, 123,000 undocumented immigrants and 64,000 legal immigrants. “All immigrants are less likely to be incarcerated than natives relative to their shares of the population,” the Cato study reads. that immigrants commit crimes at lower rates than American-born citizens and that violent crime rates in the U.S. plummeted as immigrant populations increased. Meanwhile, a separate analysis by the Cato Institute found that all immigrants — including the undocumented — are less likely to be incarcerated than native-born Americans.